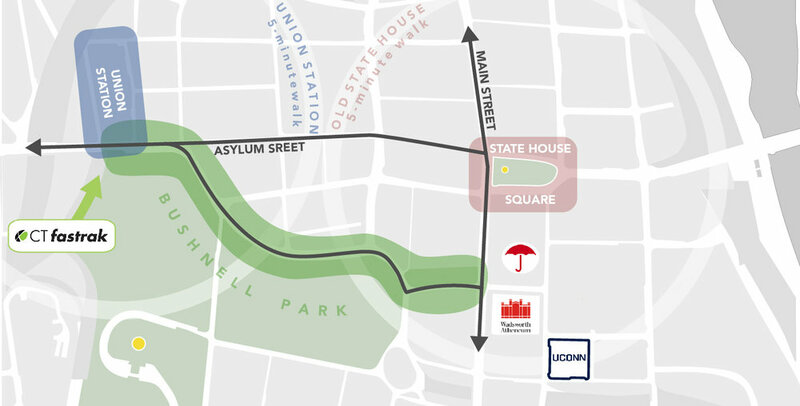 This $23M downtown transit, streetscape, and park improvement project, funded by the US Department of Transportation's TIGER program and the City of Hartford, is a direct implementation of the city's award-winning public/private partnership, the iQuilt Plan. In 2012, Hartford was preparing for the introduction of bus rapid transit service and increased railroad service to its Union Station. The station, however, felt isolated, despite being only half a mile from Main Street and the downtown core. The Intermodal Triangle was conceptualized as a project to improve connections between Union Station and Main Street through improvements to the station itself, traffic calming around the Old State House on Main Street, and transforming a speedy half-mile motorway along Bushnell Park into a graceful pedestrian promenade between Union Station and the Wadsworth Atheneum Museum of Art. Construction began in the spring of 2015, and is nearly complete. While serving as Complete Streets Coordinator, JVM Studio's Jonas Maciunas was responsible for managing all aspects of the project, including collaborative project conception and grant application, budget development, engineering consultant selection, design management and oversight, coordination of City departments and partner agencies, public outreach and input solicitation.